I get asked a lot about eating out. I do eat out, sometimes more than just on date night (which is also my treat meal). So how do I stick to my Clean Eating lifestyle while chowing down in a restaurant? It's actually pretty easy. Throughout my weight loss journey, then on into maintenance (and particularly during contest prep) I learned how to order like Sally. (10 points if you got the reference before I share it below, lol). 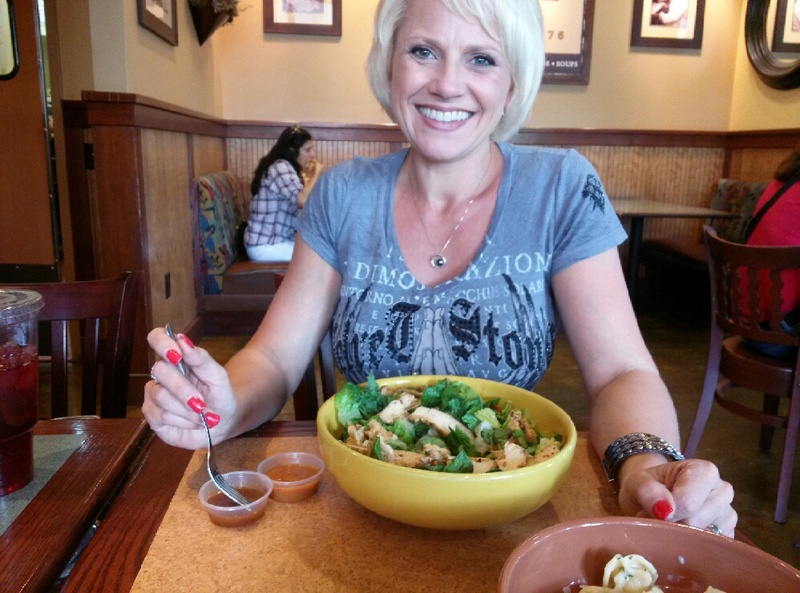 Today, my youngest and I hit up Paradise Bakery for lunch (aka Panera). I really enjoy Paradise as I can get a ton of flavor, while still staying on track. I love their Thai Chopped Chicken Salad, but have you ever looked at the nutritional info for restaurant salads? They can be terrifying! Many salads are worse than a trip through the drive-thru! BUT... with a little "Sally", you can salvage almost any salad into a goal-friendly clean eating meal! "I'll take the large Thai Chopped Chicken Salad with double meat, no cheese, no tortilla strips, and dressing on the side." Yep. It's that easy. What was I left with? A bowl of leaves and chicken? Nope... check it out! Dip the fork. Don't drizzle that dressing on - you don't need all that! 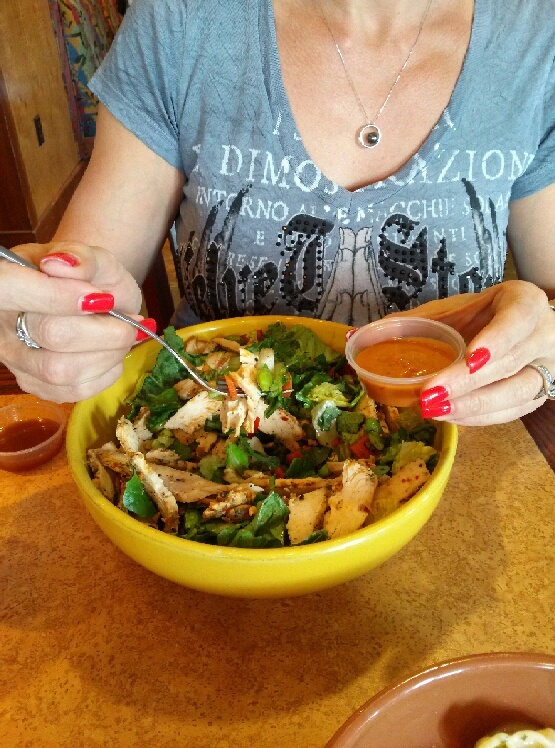 Just dip your fork in the dressing, then spear up a bite and enjoy! 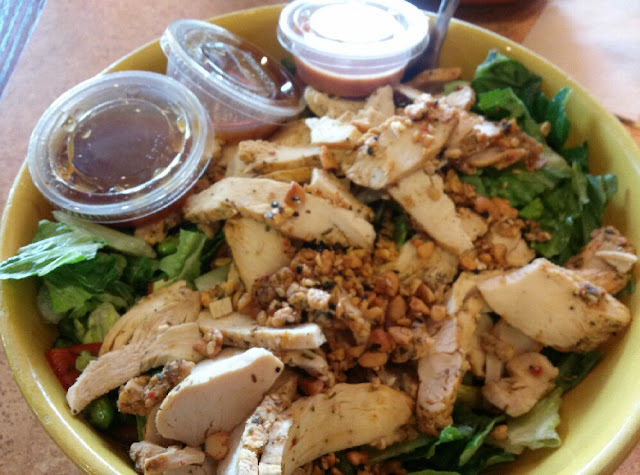 You get the flavor of your dressing without the excess. Dip and spear. Dip the fork in the dressing, then spear yourself a tasty bite! Save yourself a TON of calories, without losing any flavor! If you know ahead of time where you'll be dining, look them up online - find the menu and nutritional info. While Paradise Bakery doesn't offer their nutritional info online, the parent-company Panera does. They've even got a great interactive calculator that will help you "Sally" your order. My meal? Came in around 470 calories with roughly 50g protein, 24g carbs, 15g fat. Factor in that I didn't finish it (it was big! ), and didn't use but 1/4 of the dressings... my numbers were even better! Don't be afraid to be a Sally when ordering your food. You're paying for it, order it the way you want it... and if it comes to you wrong- send it back. Be nice! But send it back and repeat your requests. In this day of food allergies and intolerance's restaurants have become a lot more cooperative with special orders. Take advantage of that. And if anyone hassles you about the way you order, let them know that they are free to order like Harry, you'll stick with Sally. It's your plate, your goals, and your right. 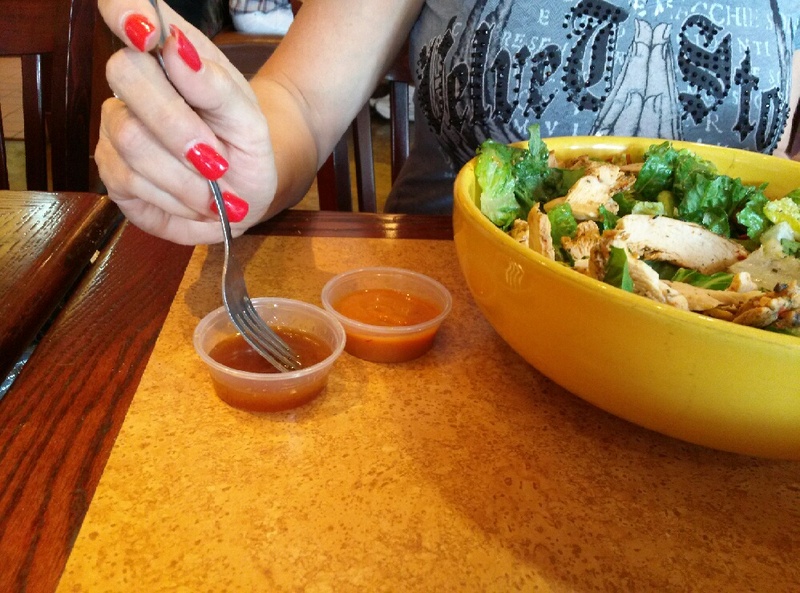 I usually go without the dressing but love the idea of dipping the fork in the dressing. Cool idea. What an awesome salad hack! You may have just made my lunch decision for me. Cheers!